Distribution : Molucca archipelago , Celebes archipelago, Sulawesi. Epiphytic plant with short stem completely enclosed by imbricating leaf sheaths. Roots fleshy, elongate, gray silver plated, whit green tip. Few leaves, 3 to 4, more abundant in culture, 6 or more, fleshy, elliptic or oblong-elliptic or oblong-oblanceolate, obtuse or emarginate apex, 25 cm or more long , 8 cm or more broad, pretty shining green, slightly careened at the lower face. Lamina more or less undulating. Flower stalk generally much shorter than the foliage, arched or spread out, bearing few flowers, seldom branching. The plant often emits several stalks simultaneously. The flowers follow one another during several months, even several years. Bracts of 7 mm, triangular, dorsally careened. 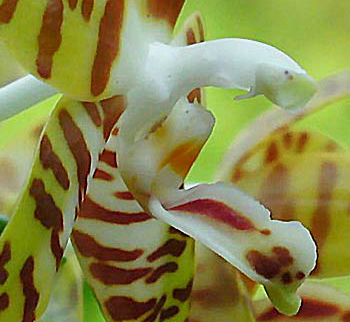 Flowers from 4,5 to 5 cm, sometimes more. Well spread out floral segments. Dorsal sepal elliptic or oval-elliptic, acute, slightly dorsally careened at apex, twice longer than broad. 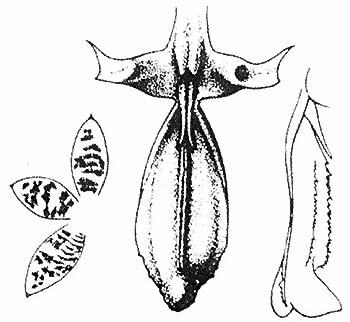 Lateral sepals oblique, largely oval or oval-elliptic, acute or slightly rounded, dorsally careened like the dorsal sepal. All the sepals are of the same size. 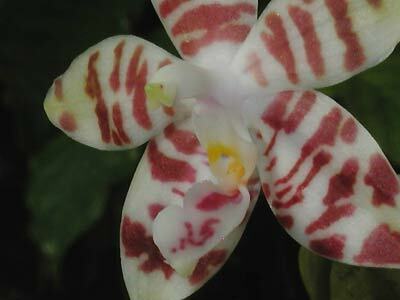 Petals sometimes oblique, oval or rhomboid, acute or obtuse, sometimes shorter than the sepals. 3-lobed lip as long as the petals or a little shorter. Oblong-ligulate lateral lobes, erect, fleshy, connivent, with falcate apex. Bitween lateral lobes a cushion-like callus. Midlobe oblong-oval, or oblong-elliptic, very fleshy, concave, glabrous, largely furnished with a keel with two parallel edges finely notched. The disc between the side lobes is provided of 2 callus superimposed, bifid; the anterior of which is acicular and much surpassing the junction of the midlob and lateral lobes. The posterior callus white, is marked of yellow on the front. Fleshy column, arched, white, at widened base underlined by two thickenings on both sides of the foot. Pedicellate ovary 3 cm long. 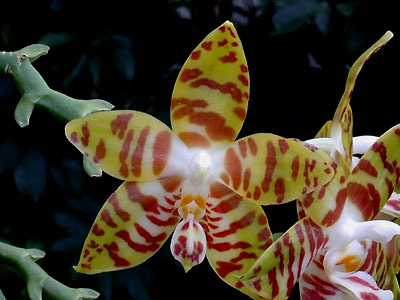 All the floral segments cream-coloured, yellow or yellow-greenish, sometimes tinted orange, are barred concentrically brown more or less reddish. Base of petals and sepals white. Segments tip often marked of green. Lateral lobes white, yellow on callus level. Yellow midlobe sometimes with one or two longitudinal magenta stripes on each side of the keel. One deferred the existence of green carthusian specimens (Sulawesi island in Celebes). Flowering is possible all the year. 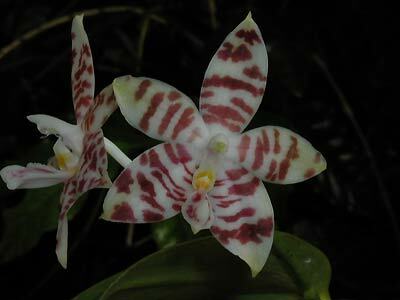 Confusion was sometimes made between Phalaenopsis amboinensis and Phalaenopsis sumatrana. The details of lip and the shape of the column make it possible to avoid this problem. 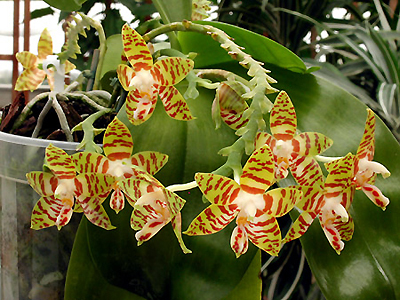 Phalaenopsis amboinensis was described for the first time in 1911 starting from specimens originating in the island of Ambon (Moluques), cultivated at the botanical garden of Bogor (Java). 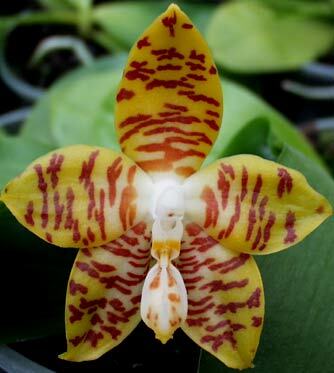 A specimen collected during the voyage of the Astrolabe between 1838 and 1840, today in the Natural history museum in Paris under the name of Phalaenopsis hombronii is in fact Phalaenopsis amboinensis.